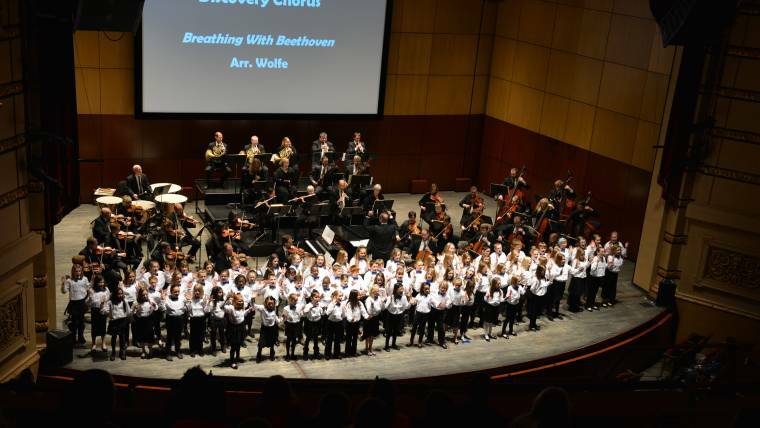 Students in kindergarten through sixth grade have the opportunity to develop their innate joy of music making by performing with one of Orchestra Iowa School’s three youth choruses. Participants develop skills in choral singing by exploring a variety of choral repertoire. New students are accepted into the choruses at several appropriate times throughout the year. If you miss the fall audition dates, call the office for more information. Children in second and third grade are invited to participate in Odyssey Chorus, a preparatory choir designed to instill good vocal habits, beginning music reading and appropriate choir behavior. A variety of kid-friendly and educationally sound literature is selected to build vocal skills and proficiency in unison and part-reading. This chorus also aims to prepare singers for the Discovery Chorus and provides numerous performance opportunities throughout the school year. Students wishing to be accepted into the Odyssey Chorus should prepare “My Country ‘Tis Of Thee” for the audition. Tuition: $150 – plus $25 fee for performance shirt and tie. Students in fourth, fifth and sixth grade are invited to audition for Discovery Chorus, a long-standing Orchestra Iowa School program designed to help young singers become acquainted with quality choral music and build good vocal technique. Approximately 100 students are selected annually by audition and have the opportunity to perform with Orchestra Iowa. Students wishing to be accepted into the Discovery Chorus should prepare “America the Beautiful” for the audition. Tuition: $155 – plus $25 for performance shirt and tie.